Energy Suspension's Hyperflex polyurethane is covered by a 2 year warranty handled in-house at DST. This is a bulk item and may require a quantity limit to purchase. Contact our DST Customer Service Team for orders and more information! This part is currently not stocked at any of our warehouses. However we can have the part shipped directly to you from the manufacturer Energy Suspension. 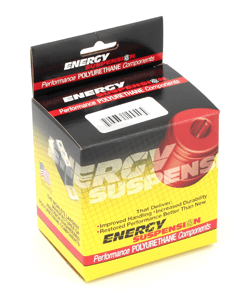 Special orders from Energy Suspension typically ship within 1-2 weeks. This longer shipping wait is because Energy Suspension doesn't warehouse their parts. Parts are manufacturered when an order is placed - so the wait varies depending on where Energy Suspension is in their manufacturing cache.